There are 3 main windows in Bolt. You can find them all in the “Windows” menu. The layout in which you decide to place the windows is a matter of preference. 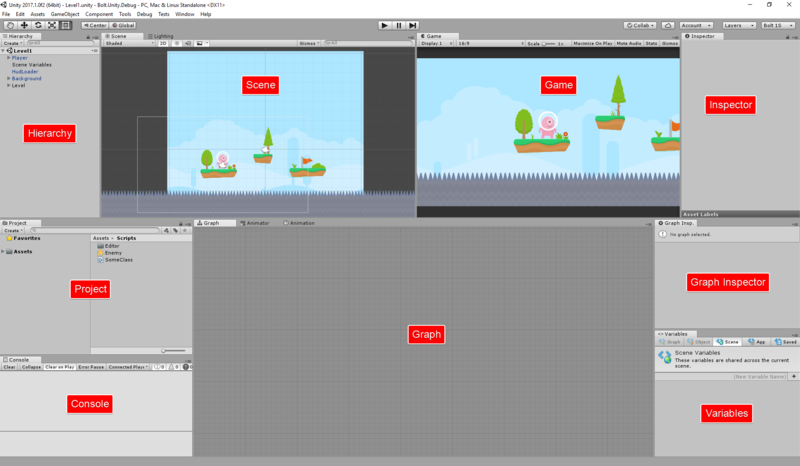 We recommend giving equal space for the graph window and the scene view — you’ll need it! 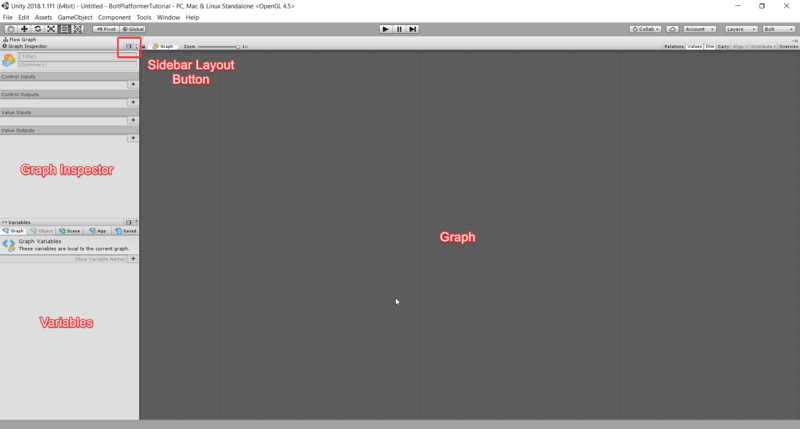 We also suggest adding the graph inspector as another tab next to the Unity inspector. The Sidebar Layout Buttons allow you to reorder and move each panel around your maximized viewport. If you have dual monitors, you may want to put Bolt on your second monitor entirely. 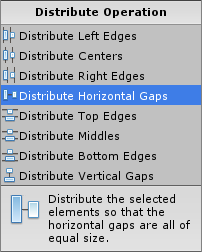 This gives you a lot of room for graph editing and keeps your usual Unity layout intact. The window will automatically detect that it has enough space to display the sidebars. Once you select a graph, a toolbar will display in the graph window. On the left, you can see the breadcrumb path to the currently selected graph. The Zoom slider allows you to zoom out and get a bird’s eye view of the graph. When the Relations option is checked, units will display their inner connections (flow graphs only). When the Values option is checked, Bolt will attempt to predict values and show them in graph connections (flow graphs only). When the Carry option is toggled, child nodes of your current selection will be dragged along it. This is useful if you want to reorganize a large part of the graph without manually selecting each node. The Overview button will pan and zoom the graph in order to show all of its elements within the area of the window. When in the graph window, there are two Control Schemesthat determine how to pan and zoom. 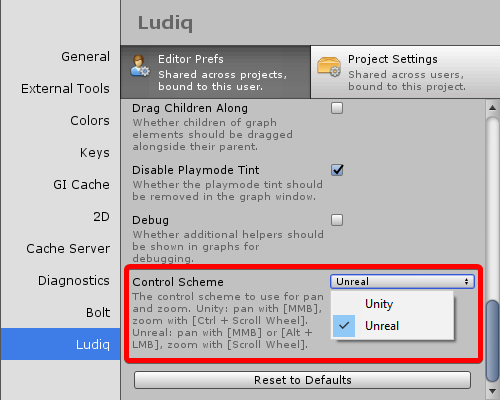 You can configure your control scheme in Tools > Ludiq > Editor Preferences… > Graphs. By default, it is set to Unreal. If you have a trackpad, try changing that setting to Unity. This will make navigating the graph with easier with two fingers. The graph inspector shows information and settings about the currently selected graph element. We’ll get into it later when we examine each type of graph. The variables window shows all your variables. We’ll get into it later when we learn more about variables.